Item number 2615/4 from the MOA: University of British Columbia. 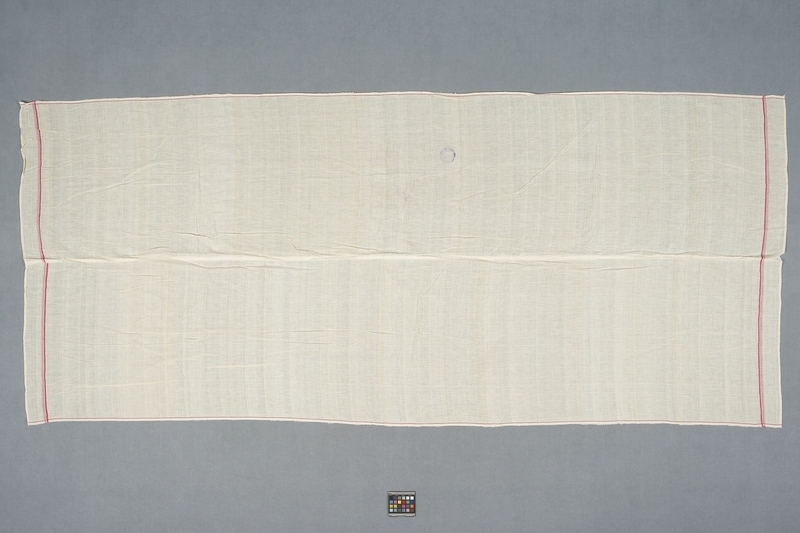 Large rectangular turban cloth made from a gauze-like cotton fibre. Cloth is hemmed along two shortest ends, with a pink stripe around the border (several pinstripes added along shortest sides). Purple circular stamp mark and numerical (?) pen markings on one side. Vertical seam up the middle. Rough, uneven side edges. Turbans of this type were commonly worn by men of the Koli caste in Dhamlej Village as of 1999. They were worn as a set with a shirt, either in Indian or western style, as well as with pants with a wide drawstring waist, low crotch, and narrow legs, with all except the turban being of matching fabric.. Members of that caste assisted in the production and gathering of this clothing. The cloth for the clothing was purchased in Kodinar town, 7 km. to the east of Dhamlej. Such clothing was also worn by men of the Hindu Rabari caste. Younger male villagers preferred, however, to wear western-style shirts and pants. This type of hand-spun, hand-woven cotton is called khadi and was used by Ghandi as a way of asserting Indian cultural and political independence against the British. Worn on a daily basis. 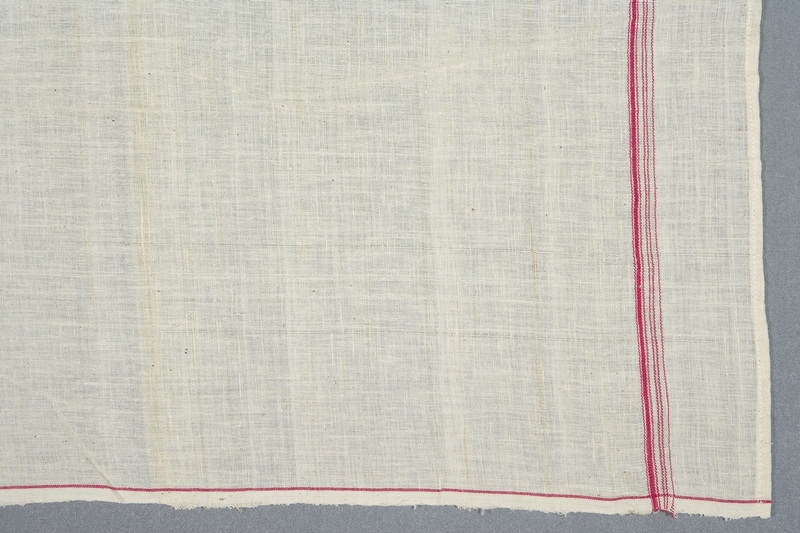 This turban cloth was collected with the help of Hindu Koli men, but this type was also worn by Hindu Rabari men. This collection was gathered with the enthusiastic participation of villagers in Dhamlej, reflecting Derek Johnson’s rapport with them. They allowed him to take photographs of them demonstrating how the clothing was put on and worn. These photographs are available in the Museum of Anthropology collection documentation file for accession 2615.